Painted Turtle Book, 9780814341193, 128pp. Although his best-known project was the World Trade Center in New York City, Japanese American architect Minoru Yamasaki (1912-1986) worked to create moments of surprise, serenity, and delight in distinctive buildings around the world. In his adopted home of Detroit, where he lived and worked for the last half of his life, Yamasaki produced many important designs that range from public buildings to offices and private residences. 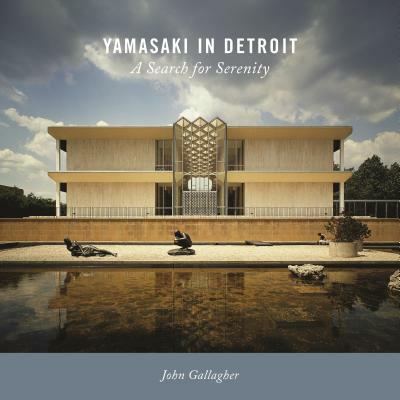 In Yamasaki in Detroit: A Search for Serenity, author John Gallagher presents both a biography of Yamasaki-or Yama as he was known-and an examination of his working practices, with an emphasis on the architect's search for a style that would express his artistic goals. Gallagher explores Yamasaki's drive to craft tranquil spaces amid bustling cities while other modernists favored -glass box- designs. He connects Yamasaki's design philosophy to tumultuous personal experiences, including the architect's efforts to overcome poverty, racial discrimination, and his own inner demons. Yamasaki in Detroit surveys select projects spanning from the late 1940s to the end of Yamasaki's life, revealing the unique gardens, pools, plazas, skylight atriums, and other oases of respite in these buildings. Gallagher includes prominent works like the Michigan Consolidated Gas Building in downtown Detroit, Temple Beth-El in Bloomfield Township, and landmark buildings on the Wayne State University and College for Creative Studies campuses, as well as smaller medical clinics, office buildings, and private homes (including Yamasaki's own residence). Gallagher consults Yamasaki's own autobiographical writings, architects who worked with Yamasaki in his firm, and photography from several historic archives to give a full picture of the architect's work and motivations. Both knowledgeable fans of modernist architecture and general readers will enjoy Yamasaki in Detroit. Wayne State University Press gratefully acknowledges the organizations that generously supported the publication of this book: Friends of Modern and Contemporary Art, Detroit Institute of Arts, Yamasaki, Inc. and The Office of the Vice President of Research (OVPR) of Wayne State University. John Gallagher is a veteran journalist and author whose book Reimagining Detroit: Opportunities for Redefining an American City was named by the Huffington Post as among the best social and political books of 2010. His most recent book is Revolution Detroit: Strategies for Urban Reinvention. John was born in New York City and joined the Detroit Free Press in 1987 to cover urban and economic redevelopment efforts in Detroit and Michigan, a post he still holds. His other books include Great Architecture of Michigan and, as co-author, AIA Detroit: The American Institute of Architects Guide to Detroit Architecture. John and his wife, Sheu-Jane, live along Detroit's east riverfront.